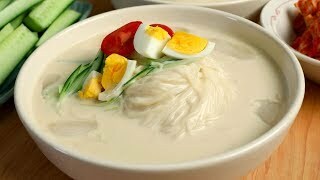 Cold soy milk noodle soup (Kongguksu: 콩국수) is great for the summertime: it’s a dish of thin wheat flour noodles in a cold, creamy, nutty and refreshing soy milk broth. 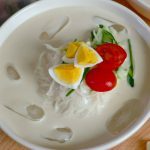 I first shared my kongguksu recipe on my website nine years ago! I’m always experimenting and testing in my kitchen to make more delicious version of my recipes, so now it’s time to share this new version. The real secret to this recipe is in making nice smooth soy milk. A powerful blender is useful or you can just keep grinding the beans until you have smooth milk. Let’s make such a simple, quick, nutritious, and delicious kongguksu and enjoy our summer! Strain the beans and add them to a heavy pot with 2 cups of water. Cook for 15 minutes over medium high heat, uncovered. Then cover and simmer for another 5 minutes over low heat. Remove from the heat. Uncover, stir, and let them cool down for 10 minutes. Transfer the beans and the water from cooking them (about ½ cup) to a blender. Add 3 cups of cold water, the pine nuts, and the sesame seeds. Blend at high speed for 1 to 2 minutes, until everything is smooth and creamy. It may take longer depending on the power of your blenders. Transfer the soy milk to an airtight container or glass jar and refrigerate for up to 24 hours until you’re ready to make kongguksu. Bring a large pot of water to a boil over medium high heat. Add the noodles and stir them with a wooden spoon so they don’t stick together. Cook for 2 to 3 minutes. If it boils over, stir and crack the lid. Taste a sample to see if the noodles are cooked. You can use chopsticks or tongs. There shouldn’t be anything hard in the noodles when you chew them. If there is, cook them longer. If they are done, remove from the heat. Transfer the noodles to a large strainer and rinse them in cold running water. Gently rub the noodles between your palms and in the strainer until they are cold and not slippery. Divide the noodles into 2 equal portions and gently squeeze excess water from each portion and put them into 2 large shallow bowls. Bring the soy milk from the refrigerator. Add the salt and stir it in well with a wooden spoon. You can add more or less salt depending on your taste. Pour the soy milk on top of the noodles in each bowl. Place cucumber, egg, tomato pieces on top of the noodles. Add some ice cubes if you use. Serve right away with kimchi and a few more side dishes. Posted on Monday, July 6th, 2009 at 9:24 am. Last updated on September 1, 2018. Posted December 3rd, 2018 at 3:17 pm | Log in to reply. Your Kongguksu recipe was so delicious! It would have been perfect on its own but we ate it with some side dishes. It’s almost always warm in Florida so my husband and I make your cold soup recipes all year long! Posted September 14th, 2018 at 3:40 pm | Log in to reply. Hi Maangchi! Does this taste like soya milk? Posted August 27th, 2018 at 8:53 am | Log in to reply. Posted July 17th, 2018 at 5:56 am | Log in to reply. This recipe I have been watching several time. And I noticed that you added ice. I just thought, would it be okay as well if I blend it with ice? Since I will be adding water when I puree the soybean, ice might water it down and affect the flavor? :D Hehe.. Just my thought..
Posted August 27th, 2017 at 5:13 pm | Log in to reply. Today I wanted it but I was too tired to make soy milk. I used to live in Thailand so I am familiar with the taste of homemade soy milk. So, I tried buying plain soy milk with no sugar. I only added salt and mixed nuts & it tasted wonderful! I am glad it worked. The soup was so refreshing and I will make it many more times before it gets cold outside. Question: I cannot eat wheat so I used very thin sweet potato noodles and they were nice, but do you have any other ideas for a good replacement noodle that is not made of wheat? Posted August 27th, 2017 at 5:14 pm | Log in to reply. Posted August 31st, 2017 at 10:01 am | Log in to reply. Thanks for the tip for the noodles, a lot of my readers who can’t eat wheat will also appreciate it. It looks wodnerful to me, and delicious. Posted July 24th, 2015 at 1:57 am | Log in to reply. Posted May 29th, 2015 at 4:10 pm | Log in to reply. Posted July 8th, 2014 at 2:54 pm | Log in to reply. Posted February 1st, 2014 at 12:22 am | Log in to reply. hello maangchi! i have been following your recipes for a while now, and this is the best korean cooking websites I ever found! all your recipes are delicious and easy to follow (especially with the pictures). I’m wondering what kind of mixed nuts you used? peanuts, almonds, walnuts? or maybe other kind of nuts? I just hope it’s not as expensive as pine nuts. Posted July 10th, 2012 at 2:59 pm | Log in to reply. Maangchi, this is my favorite food ever! :) I can’t thank you enough for sharing this recipe. I eat this every day! I find one batch can make me four servings of kongguksu, which is amazing. I cook 2 cups of soybeans at a time now and freeze 4 bags at a time, so I can always have some homemade soymilk on hand for delicious kongguksu! The nuts really add such a delicious taste to the milk. Posted July 10th, 2012 at 9:40 pm | Log in to reply. “I cook 2 cups of soybeans at a time now and freeze 4 bags at a time, so I can always have some homemade soymilk on hand for delicious kongguksu!” What a great tip it is! My cousin has been making soy milk for her family for years and years just like you! If you have time, please copy your post and paste it on the forum so that I can give the link if I’m asked by my new readers. Posted June 11th, 2012 at 10:03 pm | Log in to reply. This recipe looks delicious and I want to try this at home. I am sure my family would really like it also.We all know that Korean cuisines are very healthy and delicious just like this kongguksu. Thank you Maangchi for the recipes that you’ve shared in here. Keep on posting lots of recipes. Posted June 13th, 2012 at 10:00 am | Log in to reply. Thank you so much for your nice words! Yes, this kongguksu broth is really delicious. My cousine has been making it every morning for breakfast for her and her husband for years. She put each portion of cooked soybeans in the freezer and every morning take one package and blend it with nuts and milk. She eats it with vegetable and fruit salad. She is in her 60s but she doesn’t have any problems with her health and besides she looks really younger than her age. Posted June 10th, 2012 at 4:28 am | Log in to reply. Posted June 13th, 2012 at 10:01 am | Log in to reply. What a cute story it is! : ) ” I made the broth and had it with my morning porridge.” smart! Posted January 4th, 2012 at 4:36 am | Log in to reply. I think this is too healthy for me :x but it’s a wonderful recipe. The tomatoes helped to add some natural saltiness. The cucumber added crunch to the noodles. I used somen and it was good. I had extra unsalted soy milk so it became my breakfast the next day. I blended it with some honey! Posted June 13th, 2012 at 10:02 am | Log in to reply. Posted September 1st, 2011 at 11:12 am | Log in to reply. Hi Maangchi! I just came across your website last night after i had a sudden craving for Konggooksoo. I did not know that it was so easy to make! OMG I love your recipes and I have been hooked since last night viewing your youtube videos. I am Korean but don’t know how to cook very well since my mom used to do all the cooking but now she’s back in Korea and nobody to cook Korean food! You make it look so easy to cook. You are like a Jamie Oliver for Korean food. Posted September 1st, 2011 at 12:41 pm | Log in to reply. Posted May 22nd, 2011 at 2:25 am | Log in to reply. 언니!! Thank you so much for all your recipes!!! You are my life saver! 콩국수 was super delicious I finished all the soup to the very last drop! Even my mother in law said it was good and she is normally very picky about what she eats! I am truly thankful for your website! Because of you my family thinks I’m a chef ;)! I am going to make this again very soon! Yum! I didn’t even use mixed nuts or sesame seeds and it was still really good! This recipe was originally posted on July 6, 2009 at 9:24 am by Maangchi. It was last updated on September 1, 2018. The video was watched 387,478 times on YouTube & has 13,438 likes! This video is a remade version of an earlier recipe. The original video was posted on 2009-07-06 and has 215,146 views.